As you probably know, we’ve just re-issued Paul Avrich’s long-out-of-print biography, An American Anarchist: The Life of Voltairine de Cleyre. It’s an amazing study that Robert P. Helms, in a new foreword for this edition, rightly points out is “as readable as a novel.” Below, we’re sharing a portion of Avrich’s preface to the book, which outlines the interests and incidents that led him to this particular biography. If you want to read the rest of the book, you’ll find it here. 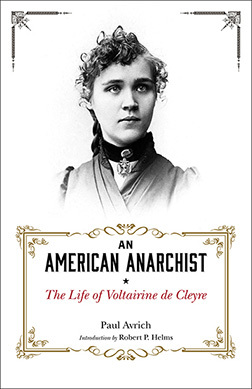 This biography of Voltairine de Cleyre, one of the most interesting if neglected figures in the history of American radicalism, is designed to be the first of several volumes dealing with anarchism in the United States, a project on which I have been engaged for the past six years. When I began my work, I expected to treat the entire subject between the covers of a single volume, in which Voltairine de Cleyre would occupy a modest place. My intention at the time was to produce a comprehensive history of American anarchism from its seventeenth-century origins until recent years, embracing the individualists and collectivists, the native Americans and immigrants, the pacifists and revolutionists, and their libertarian schools and colonies. A study of this type was badly needed. For while there were a number of useful works on American socialism and American communism, the history of American anarchism remained largely unwritten. Two well-known surveys of anarchism as a whole, George Woodcock’s Anarchism and James Joll’s The Anarchists, contained brief accounts of the movement in the United States, in addition to a longer discussion by Max Nettlau in his multivolume history of anarchism, written half a century ago but never published in its entirety. On American anarchism itself most available studies were tendentious and unreliable. There were, however, a few creditable works, such as Eunice M. Schuster’s pioneering Native American Anarchism, which, if largely out of date, was still of some value, and James J. Martin’s Men Against the State, an authoritative treatment of the Individualist school, of which Josiah Warren and Benjamin Tucker were the outstanding exponents. Moreover, one of the leading Anarchist-Communists, Emma Goldman, had been the subject of a sympathetic biography by Richard Drinnon, Rebel in Paradise, in addition to which The History of the Haymarket Affair by Henry David and The Mooney Case by Richard Frost merited special attention. But much remained to be done, particularly on the immigrant groups; and in many areas scholarly explorations were completely lacking, sources uncollected and often unknown, and historical works, with few exceptions, encrusted with political and personal bias. It was considerations such as these which led me, at the beginning of the 1970s, to contemplate the writing of a general history of American anarchism. At an early stage, however, my plans began to alter. For a fuller examination of the materials at my disposal, together with the discovery of new sources, aroused a growing sense of the complexity of the movement, of the richness and diversity of its history. Again and again, I encountered important figures begging to be resurrected, tangled episodes to be unraveled, neglected avenues to be explored—too many, it was clear, to be treated in a single volume. A larger design was required to do the subject justice and to incorporate the findings of such recently published works as Lewis Perry’s Radical Abolitionism and Laurence Veysey’s The Communal Experience, which have filled conspicuous gaps in our knowledge of American anarchism and enabled us to begin to separate historical legend from historical reality. To a significant extent, moreover, the need for a general history was met in 1976 with the publication of William O. Reichert’s Partisans of Freedom: A Study in American Anarchism, a work of 600 closely printed pages with useful bibliographical references. I found myself, as a result, less and less inclined to produce an exhaustive chronological history of American anarchism. Besides, as my work happened in the movement had been due to the personal characteristics of its adherents, and that the nature of American anarchism might be profitably explored through the lives of a few individuals who played a central role in the movement and set the imprint of their personalities upon it. From most existing accounts, unfortunately, one gets little understanding of the anarchists as human beings, still less of what impelled them to embark on their unpopular and seemingly futile course. Anarchism, as a result, has seemed a movement apart, unreal and quixotic, divorced from American history and irrelevant to American life. For these reasons, I have decided to tell the story of American anarchism through the lives of selected figures who, in large measure, shaped the destiny and character of the movement. In arriving at this decision, I have been guided by the assumption that by focusing on key individuals, their dreams and passions, failures and successes, weaknesses and strengths, I can make the movement as a whole more comprehensible. I have not, however, ignored the social and economic developments of the age, but have tried, as the story unfolds, to include sufficient historical background to make the lives of the anarchists intelligible. What began then as a chronological survey has become a series of interrelated studies which, taken together, will form a kind of biographical history of a movement that included figures as striking and diverse as Josiah Warren and Alexander Berkman, Benjamin Tucker and Johann Most, Emma Goldman and Voltairine de Cleyre. By assigning Voltairine de Cleyre a separate volume, I do not mean to overstate her importance. Yet for twenty-five years she was an active agitator and propagandist and, as a glance through the files of the anarchist press will show, one of the movement’s most respected and devoted representatives, who deserves to be better known. Besides, there was so much rich drama in her life that a full-length biography was needed to do it justice. As a freethinker and feminist as well as an anarchist, moreover, she can speak to us today, across a gulf of seven decades, with undiminished relevance. For, in a remarkably detailed and articulate fashion, her writings anticipate the contemporary mood of distrust toward the centralized bureaucratic state. She was one of the most eloquent and consistent critics of unbridled political power, the subjugation of the individual, the dehumanization of labor, and the debasement of culture; and with her vision of a decentralized libertarian society, based on voluntary cooperation and mutual aid, she has left a legacy to inspire new generations of idealists and reformers. Go to https://www.akpress.org/an-american-anarchist.html to order your copy!